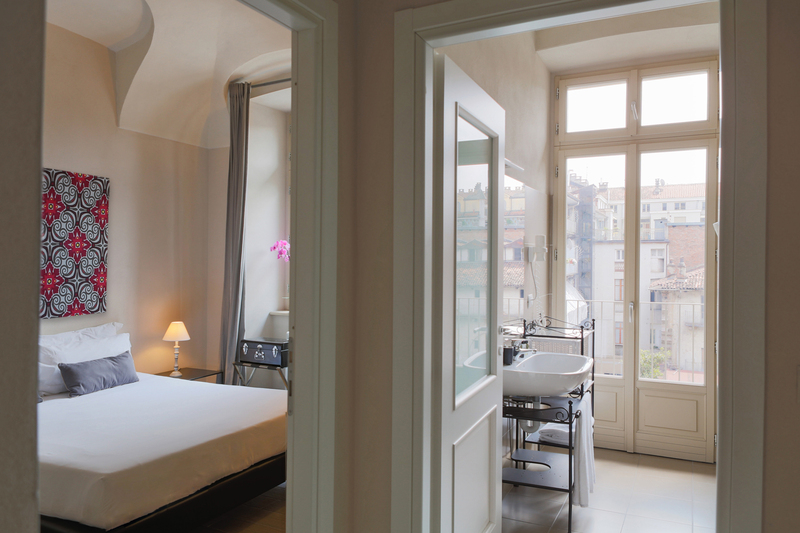 The Deluxe Room is spacious and cosy, perfect if you are in Turin for work and you want to treat yourself to a little more space and time to explore the city. With its elegant, detailed and functional decor, it is also the perfect room for two people. The living area features a comfortable sofa bed for the night and extends the room capacity to four people. The desk is ideal for working at the computer, even outside working hours or to plan your trip in a new city, maybe perusing the map to mark out your itinerary and the places you want to discover. If you love to set aside some time to relax, you have a flat-screen TV and coffee, tea, tisanes and a kettle that are available in your room. The Deluxe room gives that extra vital space, essential to feel comfortable and settle in a new place even for a short stay of one or two days. We also recommend the room to couples who want to discover Turin: in particular, the Deluxe room in the attic is perfect for those looking for romance and atmosphere to celebrate a special occasion. We are located in the centre of Turin and we cater to those seeking to relax, and those who desire to explore the city without the need for a car. The atmosphere of the residence is quiet and peaceful and the most interesting places in the city are just a short walk away.